GeoCode is an open source geolocation code. It is either a 10 digit alphanumeric number or a 3 geoname string to encode every location on Earth within 1 meter of accuracy. Every other location on earth will fall in between these values. A triple name geocode can be shortened to represent an area. The polygons are not squares, due to the a variation of the Z-order curve used to represent the points. 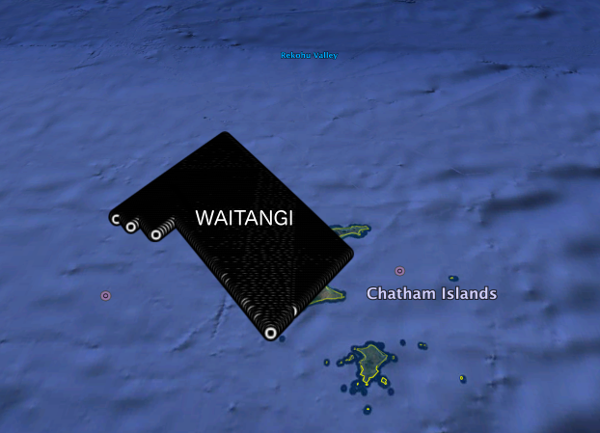 The smaller polygon (WAITANGI-USAKOS in this case) area is approx. 0.1463 km². An alphanumeric geocode in most cases is half as long as its corresponding latitude,longitude and preserves all positional properties of the latitude,longitude pair in its unshortened 10-byte form. You may find your own geocode at https://3geonames.org/ or by downloading and installing the software in your own system. Geocodes preserve location context in their triple name format, with the first name being the most prominent geoname in relative proximity. GeoCode avoids borderline discontinuities via a smooth space-filling function technique - hence nearby locations will have similar GeoCodes. In the triple name format, such locations will share the first 2 names. This system is free to use and modify. At Geocode.xyz we provide innovative geocoding and geoparsing solutions for location information. We invented the 3geoname system as a way to speed up our reverse geocoding engine. Today we are releasing it as open source seeing as it also fills a need as a location encoding system.